was born May 29th 1968 in Odessa, Ukraine. Married to Lyudmila, their son Dimitriy 6 year old. Diploma in advanced sailing courses. after graduating from the Institute he was in set-design at Odessa Film Studio and later - in commercial computer design. Mountaineering, skiing, martial arts, archery, tennis, volley-ball. Horse-riding and rowing - since 3 years old, due to "geological childhood" with his father-geologist and sea-side location of his native city of Odessa, with family summer cottage and his own boat "Ryzhyk" ("Red-haired"/ "Ginger") at the Dnestrovsky Liman (Dnestr-river Estuary) - "the ocean of his childhood". Growing up in the family of geologists, biologists and artists, and, maybe, by inheriting genes of nine generations of the Rezvoys - explorers and generals, serving Tsar's of Russia of 1800s ,- Theodore was destined to be imbued with the air of adventure. In 1992 he first learnt about Peter Bird's row from his uncle, Ivan Rezvoy, who was part of the team of support for Peter's project in Russia. 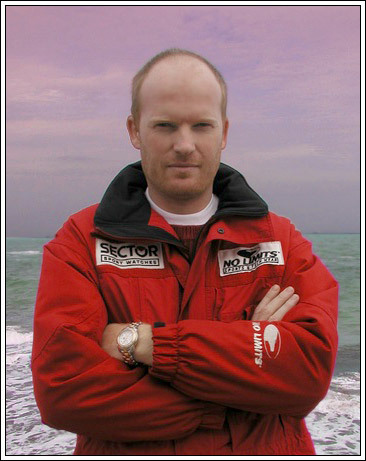 Since 2000 Theodore took over the Oceanrowing.com web-site as a web-master - responsibility, handed down to him by site's creator, Tom Lynch. Working for The Ocean Rowing Society enabled Theodore to be involved in oceanrowing directly. In 2001 Theodore successfully rowed The Atlantic ocean from East to West, from La Gomera to Barbados in 67 days 6 hrs 35 min, thus becoming the first from the Former Soviet Union to row an Ocean. Winner of the annual Municipal Action "Man of the Year"
The highest award from The Party of Greens of Ukraine - " The Golden Sunflower"